"41MR12, Burial I, 105" by Timothy K. Perttula and Robert Z. Selden Jr.
DECORATION: The rim has a scroll and nested triangle engraved motif that is repeated four times around the rim. This motif includes a central circle element between diagonal scrolls (forming a nested triangle between the engraved circles) with small excised pendant triangles. Three of the central circles are defined by two lines, with the fourth has a smaller circle within the larger outer circle, and the smaller circle has intersecting engraved lines within it. There are also hatched engraved zones above and below the scrolls. 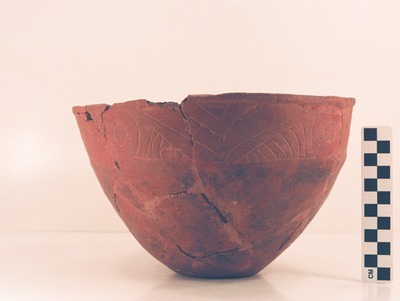 Ripley Engraved carinated bowl (MR12-105) from Burial I at the Ben McKinney site: a, photograph; b, drawing by Bobby Gonzalez.